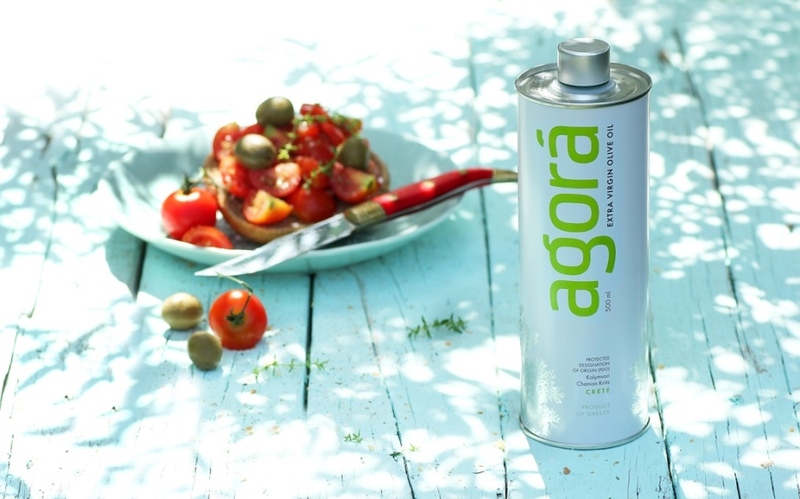 Agora comes to place on your table a product with unmatched nutritional value! We created a Premium Extra Virgin Olive Oil, Protected Designation of Origin (PDO), from Kolymvari, Chania, Crete, a region recognized worldwide and awarded for the quality of the oil it produces. The rich soil of the area, the appropriate altitude and microclimate conditions are ideal for growing olive trees, with Kolymvari’s groves stretching between Samaria and the Mediterranean Sea. 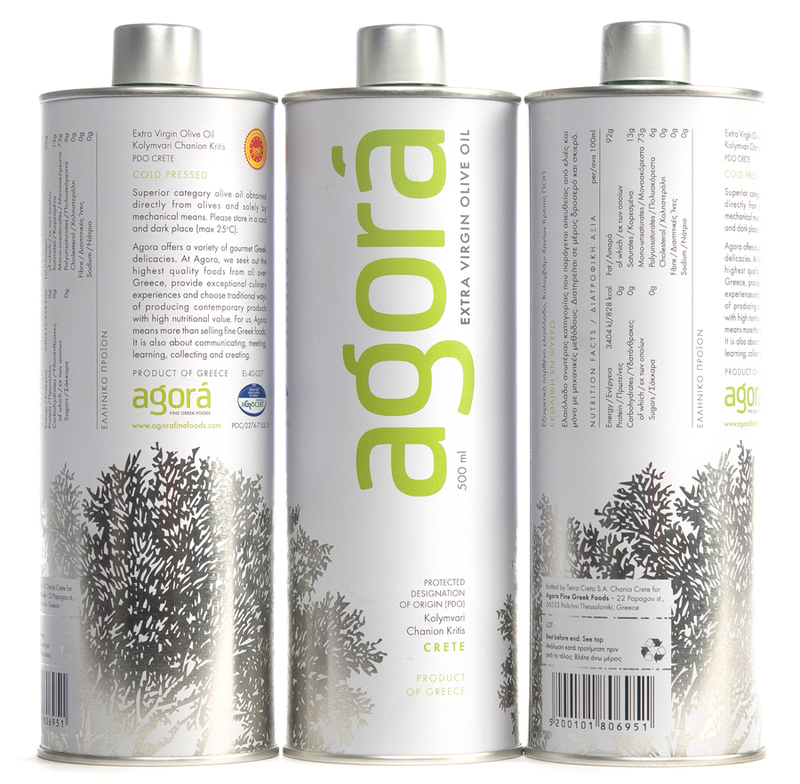 Agora offers a product with very low acidity, less than 0.4%, from the famous Koroneiki variety in special packs of 500ml. This product features a characteristic rich, fruity and peppery flavor, and meets all quality standards at all stages of production. It is collected in a short time and produced very carefully during the Cretan olive season. It is produced by cold pressing and at a temperature less than 27°C to maintain unchanged its taste and quality. 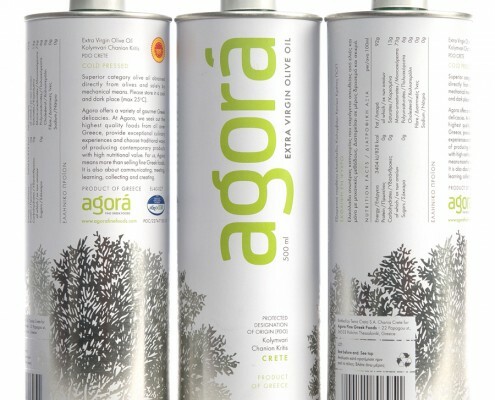 The PDO products, such as agora’s olive oil, are certified products with identity and organoleptic characteristics due to the geographical environment of origin. These products bear the name of their region. 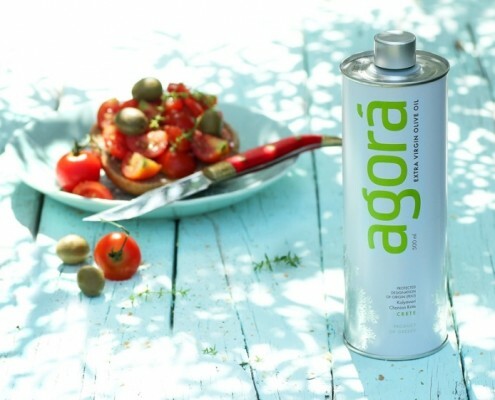 Thus, agora’s olive oil indicates its origin: Kolymvari, Chania, Crete. It will appeal to even the most discerning palates! The selected tin of 500ml protects the product throughout its use from the sun, wind and humidity. Please store it in a cool, dark place. The design of the tin is ergonomic, so the package shrinks peripheral costs, while the tin is lightweight, easy to carry, and user friendly with a label that remains intact. You get a shiny product in your kitchen that will decorate your space! And remember: Our tin is recyclable! 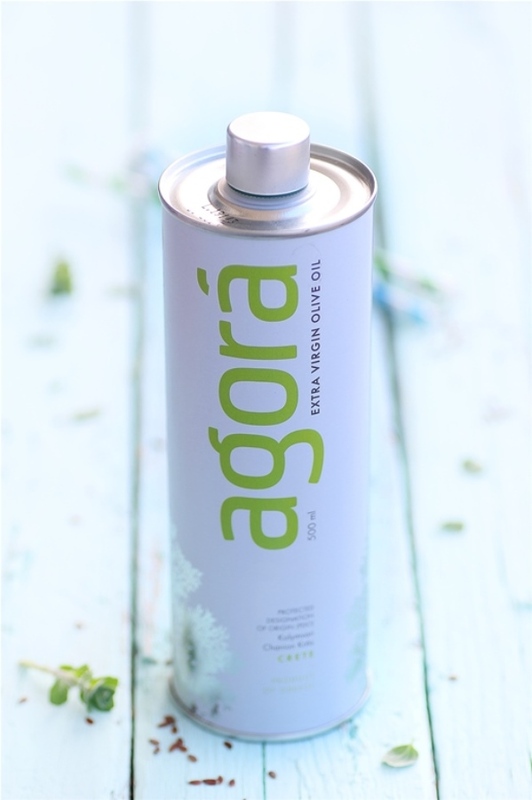 Agora extra virgin olive oil has very high nutritional value and is rich in polyphenols, antioxidants that help protect blood lipids from oxidative stress and prevent the formation of free radicals, thus exerting anticancer activity. To ensure the beneficial effects of olive oil, 2-3 tablespoons should be consumed daily. It contributes beneficially to health and balanced diet, while it has a rich flavor and aroma. Monounsaturated fats contain lower bad cholesterol (LDL). It also acts as a safeguard against diseases like heart disease, blood clots, diabetes, and skin diseases. Olive oil contributes positively to control blood pressure, reduces the chances of contracting breast cancer and of developing rheumatoid arthritis, helps create fluid bodies impacting positively to the development of the central system and bone brain, and prevents the aging of nerve cells, enhancing memory function. 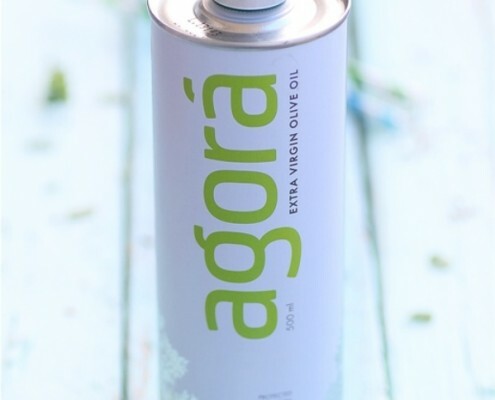 Use the agora extra virgin olive oil in your creative cooking. It highlights the vegetables in your salads and gives marinades, dressings, and sauces a uniquely rich flavor. You can use it in stews and roasts. Moreover, by drizzling olive oil 10 minutes before the end of cooking, you can lend intensity to your taste preferences. You can spread it on bruschettas as a base and, of course, you can use it for spaghetti. It gives taste to desserts of all kinds, going naturally in chocolate desserts and sweets containing yeast. You can also preserve food and sauces with olive oil to extend their lifetime. Raw, it highlights its rich characteristics and allows its aromas to emerge. Even for frying, olive oil is the only oil that can withstand high temperatures. A single tasting will convince you!